How Do You Prove Your Credibility to Your Audience? Follow up Facebook Live Q&A. Get your 30 minute consult by emailing me at rich.hopkins@gmail.com. Don't let 2019 go by without you finally getting your message on stage! Do you have a Message without a Speech? 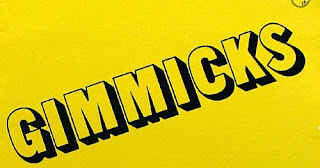 What's a gimmick? 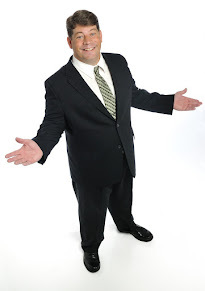 It's a lot of things - from loss leaders to crazy attention getters to outright attempts at misdirection used by marketers to bring people into their message, and hopefully put their products into their hands while they take the money out of those same hands. Gimmicks in speaking work very much the same way. They scream for attention. They can be crazy, but they can also be very creative, and effective. 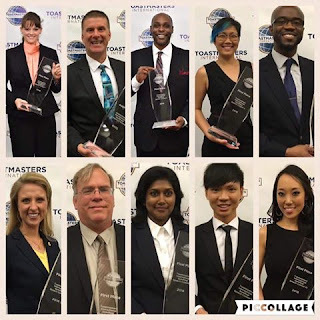 In 2016, the World Championship of Public Speaking (WCPS), a contest run annually by Toastmasters International, was won by someone who wore underwear over his suit pants for nearly the entirety of his speech. (An official video with excerpts is below - the full speech, illegally posted, can also be found, if you so desire). This brought gimmickry on the WCPS, stage to a new level - though whether that level is high or low, I'll let you decide. There are more - many more - if you know of one, post it in the comments. These are just the most memorable to me. Obviously, the gimmicks from Champs are going to stand out a bit more, in general. And it is those very gimmicks that tend to promote further gimmicks, bigger gimmicks, in subsequent years, ultimately (at least so far) leading to whitie-tighties bringing home the trophy. The word 'gimmick' is a bit loaded with, perhaps, needless negativity. The 3-point shot in basketball was a gimmick. The Golden State Warriors have done pretty well with that one. Remember, too, that the slam-dunk was at one time considered not much more than a gimmick. Gimmicks in advertising, music, movie-making, even teaching school, make for an attention grabbing situation. When used well, within a larger landscape, it is both entertaining and effective. When the gimmick outweighs the vehicle bearing the gimmick that it becomes, to me, less than desirable, less than effective, and downright annoying. When a gimmick becomes over-used - copied by others for the sake of copying - it's unbearable. To bring this back to speaking, think about this: if you tossed your gimmick entirely, would the speech still work? If Darren LaCroix, in 2001, didn't fall down in his championship speech, the entire speech would have had to have been reworked. He's known as much for falling down, for saying 'Ouch', as for anything else in that speech. In his case, the gimmick was an integral part of his speech, and was a gimmick only because it really hadn't been done before. One might say that as opposed to using falling down as a gimmick, he simply used the floor as a prop. 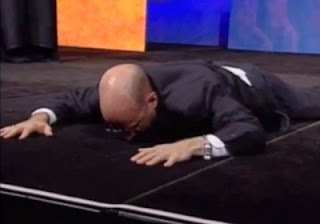 In Jim Key's 2003 winning speech - he stood on chairs. In my opinion, if you took this out of his speech, his speech still would have been a winner. Maybe it counts as half a gimmick. The sign language, however, was a stroke of genius gimmickry that made him stand out in both delivery and emotional impact. Again, a gimmick only in that it hadn't been seen. In 2006 - my own gimmick of getting the audience to stand and yell with me probably stood out to many as just that. I'm not sure if it cost me a victory, or boosted me to my 3rd place finish. Indeed, most gimmicks haven't been that bad. Or, maybe they've just become accepted and expected. I would suggest that Darren Tay's gimmick in 2016 was unnecessary. That his speech would have been just as effective if he's shows them briefly (pun intended) and moves on, perhaps bringing them back at the close. Ironically to me, his coach had at one time told me that a prop should come out for a purpose, and then be put away so as not to distract. Perhaps said coach has changed his mind since then, or perhaps Darren ignored him. Yes, the speech would have had to change in its structure a bit. But the point would have been the same. The stories wouldn't have changed. Perhaps, he wouldn't have still WON, since the 2nd place speaker also used a gimmick (57 word title). Perhaps it is WINNING, indeed the contest itself, that is inherently, the problem. Would Darren have WON without the underwear? Would Jim have WON without the chairs? Would I have WON if I had left OUT the Standing up and Shouting? It's the winning that tends to drive the decisions. The desire to out-do, out-perform, out-surprise the other speakers in order to stand out that makes gimmicks acceptable, perhaps even NECESSARY at this stage of the contest. The drive for the trophy brings us to pull crazy stunts, perhaps in place of true creativity. 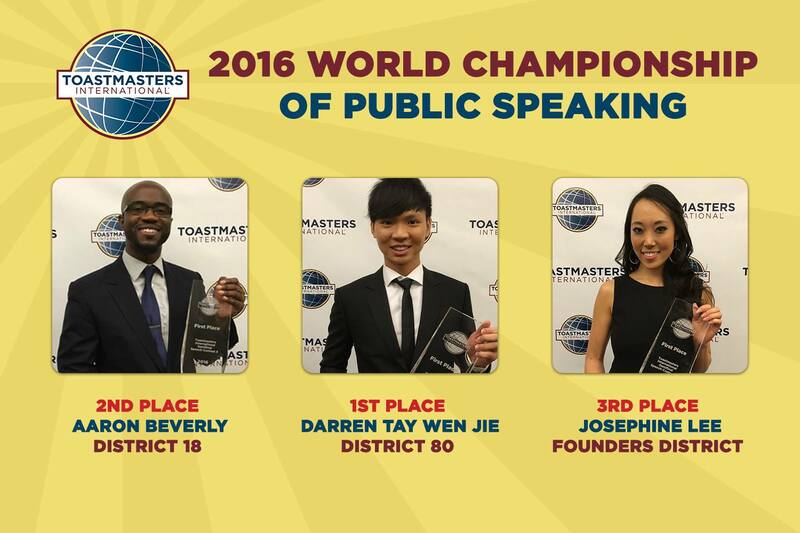 Get outside of the contest, into the corporate speaking world, and how much gimmickry do we see? I know Vince Poscente stands on chairs and skis as he tells his downhill skiing story. Pretty impressive - especially at his age (kidding, Vince). We occasionally see the crumpled up hundred dollar bills thrown on the floor as the speaker asks if anyone still wants it (is it still worth anything, they coyly ask). There's always the 'big rocks, small rocks, sand, water into a vase trick' that was popular a decade ago. But overall, I don't see many professional speakers relying on gimmicks to carry their speeches. This is in part, perhaps, due to a longer format - even 20 minute speeches in the TED format are almost 3x as long as a Toasmasters speech. 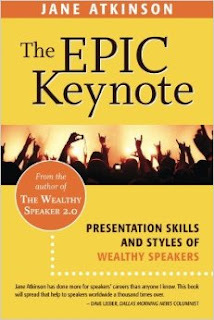 Most keynotes are 30 to 45 minutes long. Professional audiences aren't necessarily mesmerized by gimmicks unless you're already billed as a performer/speaker (magic, juggler, dancer, singer), and in fact, have been known to be turned off by such dramatics. As we go forward this contest season, lets be judicious in how we use gimmicks, as well as how we receive gimmicks. Know why you're using them, know why they are important to your audience, know whether or not you really need them. Are they just the hoped for extra points on the ballot, or are they the integral aspect that drives your point home? Do they ADD TO, or DISTRACT FROM your message? Is your gimmick all that you will be remembered for? As you go forward, speaking in the real world, don't mistake it for the Toastmaster world. Going over-the-top with gestures, costuming, even wordplay, can cost you credibility. It's a whole new stage out there, outside the supportive walls of TM, outside the slam-bam 5-7 minute speech format. Remember, no matter how many 3-pointers you shoot, the game can't be won without the fundamentals - layups, mid-range jumpers, and free-throws. 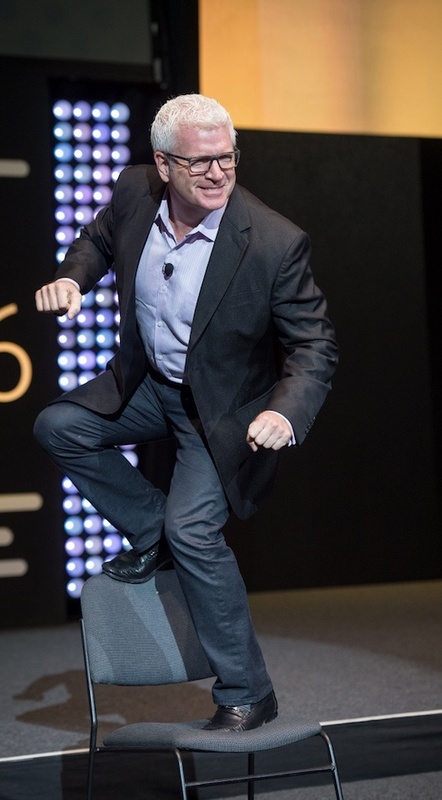 How balanced is YOUR speaking game? 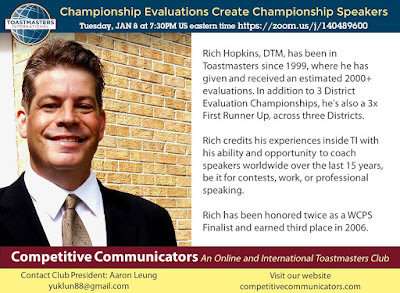 (Editor's Note) This blog isn't intended to besmirch any Champ, or even Toastmasters in general. I love the Champs, I love TM. Every winner earned it. They did what they wanted to do, what they had to do. This blog, much as my entry last August, is about understanding what is important in speaking - about our motives and how we choose to impact the audience as a higher goal than the goal of winning a trophy. Not everyone can win the trophy. But everyone CAN win the audience. (Editor's Epilogue) I intended to write this as a follow up to my blog about the 2016 World Championship of Public Speaking - a post that garnered a ton of attention, both positive and negative, and really super-charged the reach of Speak & Deliver. Like any good marketer/blogger, I promptly, if unintentionally, abandoned the blog entirely. But if you're reading down to this epilogue, know that I intend to be back on a regular basis, and a book will be forthcoming. Yesterday, I reviewed several books I've read this year in my Win Anyway Blog. Two of those books, The Art of Doing and You are a Badass, had some good lessons for speakers, but were still motivational in nature enough that I included them in that batch of reviews. The only true speaking book I've completed in 2016 is Jane Atkinson's 'The Epic Keynote' - which clearly belongs here! I like Atkinson's style in general, and her book 'The Wealthy Speaker' is a great guide for beginners. Diving in this book, I was searching for a great keynote 'formula' that would make me look at what I'm doing in a whole new way. What I got was the same old structure I always get, in the most simplified fashion possible. Doesn't mean it's bad, however. In fact, it's filled with anecdotes from other speakers, almost to a fault. Atkinson seems more intent on compiling wisdom than chronicling her own. The book covers a bit of old ground from The Wealthy Speaker, helping the reader identify the type of speaker they want to be, and who they should target. Then it hits the big topics - content, humor, style. It also talks about technology, storytelling, speaker's bureaus, and other ancillary aspects of the business, including finding a coach. I did enjoy reading 'Tips From the Masters' and 'Flashpoints' from Mark Sanborn, Joe Heckler, Patricia Fripp, Darren LaCroix, and many, many others. I also found David Leiber's storytelling formula helpful. It's easy to read, filled with short bits of accessible wisdom. If I'd picked it up 15 years ago, I'd be really impressed with it. If you're at the beginning of your journey in speaking, this is a great book for you. Just because it fell short of my likely too high expectations doesn't invalidate its content.